Description: Paul and Union with Christ fills the gap for biblical scholars, theologians, and pastors pondering and debating the meaning of union with Christ. 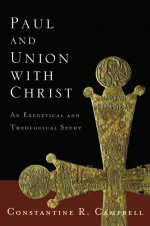 Following a selective survey of the scholarly work on union with Christ through the twentieth century to the present day, Greek scholar Constantine Campbell carefully examines every occurrence of the phrases �in Christ�, �with Christ�, �through Christ�, �into Christ,� and other related expressions, exegeting each passage in context and taking into account the unique lexical contribution of each Greek preposition. Campbell then builds a holistic portrayal of Paul�s thinking and engages contemporary theological discussions about union with Christ by employing his evidence-based understanding of the theme. This volume combines high-level scholarship and a concern for practical application of a topic currently debated in the academy and the church. More than a monograph, this book is a helpful reference tool for students, scholars, and pastors to consult its treatment of any particular instance of any phrase or metaphor that relates to union with Christ in the Pauline corpus. Citation: William Campbell, review of Constantine R. Campbell, Paul and Union with Christ: An Exegetical and Theological Study, Review of Biblical Literature [http://www.bookreviews.org] (2013). Citation: Jonathon Lookadoo, review of Constantine R. Campbell, Paul and Union with Christ: An Exegetical and Theological Study, Review of Biblical Literature [http://www.bookreviews.org] (2014).